On the night of October 4, 1967, officers of the Royal Canadian Mounted Police (RCMP) and six civilians witnessed an incredible, yet unexplainable, sight. Earlier in the evening, the RCMP had received many phone calls from residents reporting that an airplane had crashed into Shag Harbour. Both the RCMP and locals had rushed to the shore of the harbour, but what they encountered there was far from a conventional aircraft. The Department of National Defence (DND) conducted an underwater search of the area, but failed to locate any evidence of an object. 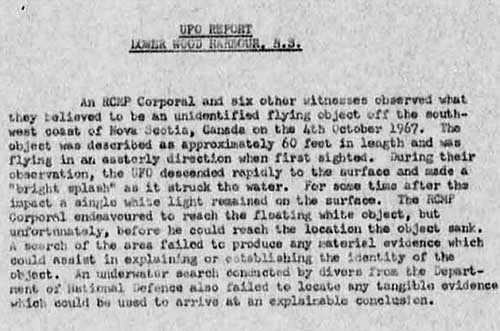 The crashing of the unidentified flying object into Shag Harbour is still discussed today, with many articles appearing on the Internet. There is no trace of the RCMP reports of this sighting in the files. The Department of National Defence has identified this sighting as unsolved, and the only documentation that exists in the files is a DND memo.